Now that we’ve cleared up meter, let’s get back to writing a sonnet. Each sonnet you write is going to be fourteen lines. It has 3 quatrain stanzas and 1 couplet. This means each quatrain is a stanza with four lines, while a couplet is a stanza with only two lines. But don’t fret too much about keeping them straight. It’s simple once you get going. **Note: Each letter represents a different word set that rhymes together. The couplet of a’s, for instance, would not rhyme with the couplet of b’s or c’s. Let’s take this step by step. In stanza one, the poet is introducing the main theme and the main metaphor. Really use figurative images to draw the reader into your poem. In the second stanza, this metaphor is made more complicated. Perhaps an example given. Then, in the third stanza, introduce conflict. Finally, the couplet you write should sum it all up and bring the reader to closure. Most themes of sonnets revolve around human life. Think about love and war. Hardship, change, and social issues are also fantastic topics. What you’re trying to do is answer a larger question about something. You’re approaching this topic on a deeper level so the reader can understand and grasp your idea. It’s also important not to forget the volta, which is Italian for turn. It could reflect a change in the theme, the metaphors or the imagery. Its purpose is to alert the reader that the poem is coming to an end. The volta changes location with each sonnet variation but it’s presence is always necessary. As you can see, this couplet is non-rhyming. For the couplet, you’re simply moving A and B down to the bottom. It keeps the traditional refrain, however, as a kyrielle poem would. It’s represented as B in the rhyme scheme. In this type of sonnet, however, each line is only eight syllables. 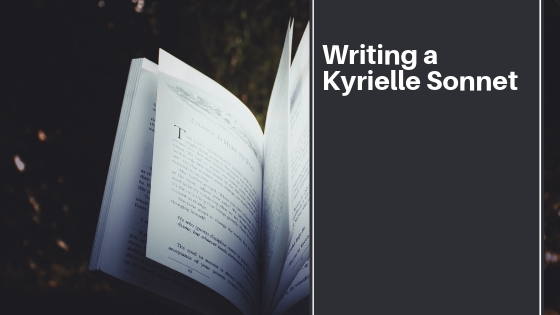 Try your hand at a Kyrielle poem today. You’ll find how they fun they are and how much they spark your creativity.